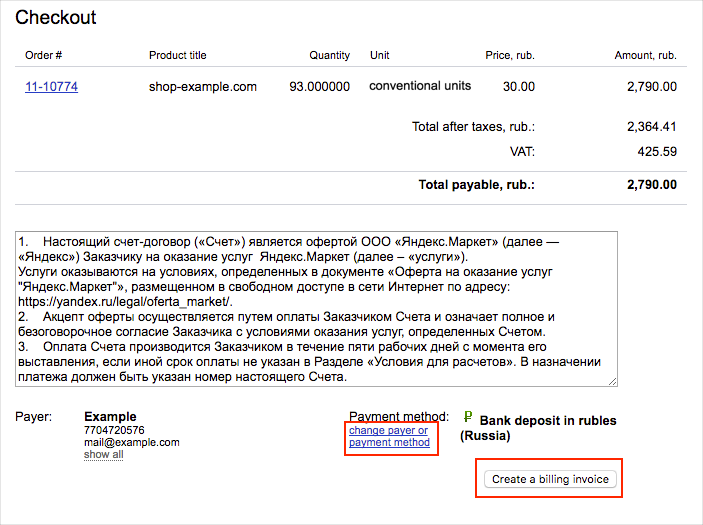 You must first deposit money in your account in order for your store's offers to start being shown on Yandex.Market. You periodically refill the account with a certain amount of money (for example, once per month). Every day, the system counts the number of clicks on your product offers and orders that your store receives from Yandex.Market. For each click, you pay the minimum price or the price that you set yourself. Once a day, the total fees for clicks that were made on that day are withdrawn from your account. All available payment methods are described in the Payment Methods section for each legal status. On the Summary page, click the Refill Account link. In the window that opens, enter the amount and click the Add to Balance button to be taken to the billing page. If you want to pay in cash and this method of payment is available for your store, click the link Pay in Cash. On the billing page, check all the data and click the Issue Invoice button. If you would like to select a different payment method or specify a different contract to make a payment for, click the link Change Payment Method or Payer. If you are paying in cash, the Cash Payment page will be loaded where you will need to enter your payment code.